Let’s face it--no one likes doing taxes at tax time. In fact, most people dread tax preparation. And when you do something that you dread, you’re bound to make mistakes. 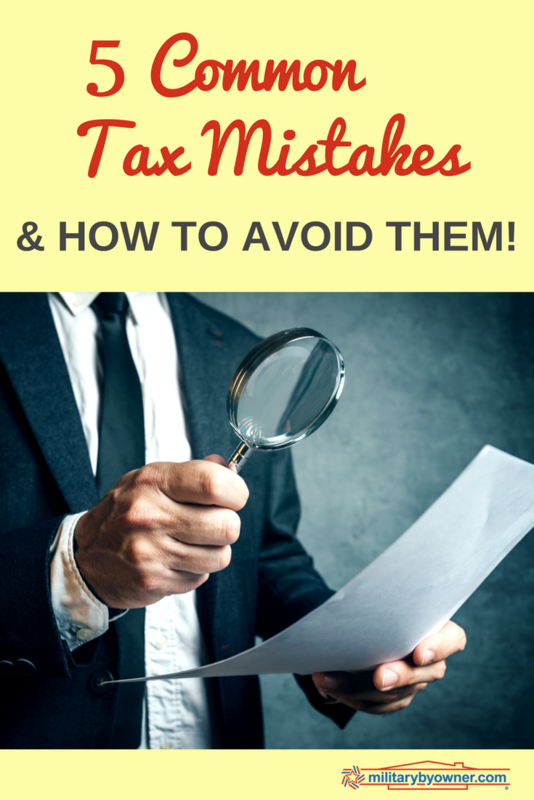 Here are five tax mistakes people make and how to avoid them. Mistake #1: Not using a tax organizer. What’s a tax organizer? It’s something that helps you organize all your tax information.Many tax professionals will give their clients a tax organizer so they can avoid getting the dreaded “shoebox full of receipts.” Moreover, a tax organizer provides the tax preparer with a checklist so they don’t overlook anything. How to avoid this mistake: Use a tax organizer. You don’t need to have a professional tax preparer to use a tax organizer. Intuit (the company that owns TurboTax provides a free download. Mistake #2: Making math mistakes. According to the IRS, over 1.6 million individual tax returns contained math errors. While that represents about 1% of the total tax returns filed, that’s still an astonishing number. When you consider that tax software does calculations much better than humans can, this is a completely avoidable mistake. How to avoid this mistake: Let your tax software do the math for you. If you insist on doing your own calculations, double-check (and triple-check) the math! Mistake #3: Not doing proper tax calculations. Although this seems like a repeat, it’s not. You can have the math right but still be wrong, if you’ve set up the wrong problem. For example, let’s say you sold some stock in Company A. You sold 100 shares valued at $50 apiece, so your capital gain is $5,000, right? Wrong. You don’t have enough information to know what your capital gain would be. Now, let’s assume that you bought this stock two years ago, for $25 per share. Using a discount online broker, you paid $10 for each trade. Now you’ve got enough information. You can calculate the capital gain by subtracting the cost (which is $2,500) AND the cost of the transaction ($10) from the total net proceeds ($5,000 minus $10). In other words, your capital gain would be $2,480. But many people would have plugged in the full $5,000 and paid tax on the entire amount. And the IRS won’t stop you. How to avoid this mistake: Know what your limits are. If you get to a point where you don’t know if you’re doing it right, then stop. Take your return to a tax professional and have them do it. Then, when you receive your tax return, have that tax professional walk you through the calculations that you had questions on, so you are better prepared the next time you see that situation in your tax return. Mistake #4: Data entry errors. Sometimes the math is right. You’ve done the right calculations, but two numbers become transposed. Suddenly, 2500 looks like 5200. Or an extra digit makes its way in there, so 2500 becomes 25000. Or 2500 becomes 250. What happens? One of two things will happen. Either the mistake will be in your favor (in the form of a lower tax bill) or the IRS’ favor (meaning a higher tax bill). Good news. If the mistake results in a lower tax bill, the IRS will help you correct it. Then they’ll recalculate the tax bill and kindly inform you of how much you owe them. Plus interest. But, if the mistake results in a higher tax bill, the IRS will kindly accept your additional payment and stay out of your hair. Doesn’t sound like good news at all, does it? How to avoid this mistake: Comparing this year’s return to last year’s return should help you notice if something is out of line. However, if you’ve experienced a major change or conducted some one-time transactions (like selling a rental property), you’ll want to go through the returns line by line just to be sure. Mistake #5: Not setting enough time to complete your return properly. Most people put taxes on their to-do list along with other household tasks like spring cleaning. Unlike those other tasks, once your return is filed, it’s hard to go back and fix those mistakes. Collect and organize your documents. Make sure you understand all the tax-related events that occurred (as well as how to calculate them). If this is usually a 4-hour task, but you need to cram it into an hour and be done with it, you’ll probably make a mistake.mAnd you’ll probably spend more than 4 hours fixing it. How to avoid this mistake: Start early by having a system to collect your documents as they are sent to you (or use a tax organizer). Then set aside two shorter periods of time. The first is the time that you’ll need to do the return preparation. Then, a few days or week later, come back with a fresh set of eyes to look at it. Or hire a tax professional. It’s their job to be stressed around tax time. And your time might be worth that few hundred dollars that a CPA or enrolled agent would charge you. Tax returns shouldn’t be something to dread. While they’re a necessary way of life, you shouldn’t fear them any more than taking out the garbage or mowing the lawn. If you avoid making major mistakes, you can take the stress out of tax season while maximizing the money you keep in your pocket!